Kenzo is a Computer Algebra system devoted to Algebraic Topology, and written in the Common Lisp programming language. It is a descendant of a previous system called EAT (for Effective Algebraic Topology). Kenzo shows a much better performance than EAT due, among other reasons, to a smart encoding of degeneracy lists as integers. In this paper, we give a complete automated proof of the correctness of this encoding used in Kenzo. 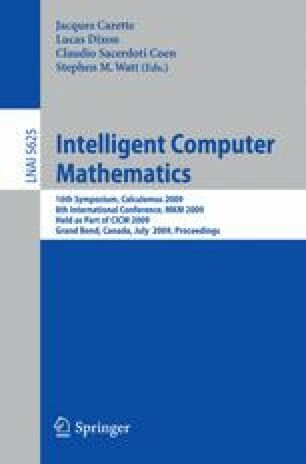 The proof is carried out using ACL2, a system for proving properties of programs written in (a subset of) Common Lisp. The most interesting idea, from a methodological point of view, is our use of EAT to build a model on which the verification is carried out. Thus, EAT, which is logically simpler but less efficient than Kenzo, acts as a mathematical model and then Kenzo is formally verified against it. This work has been supported by Ministerio de Educación y Ciencia, project MTM2006-06513.